Batwoman #13 Review – AiPT! Kate Kane returns to her old family home and deals with some old ghosts in the start of a new arc! 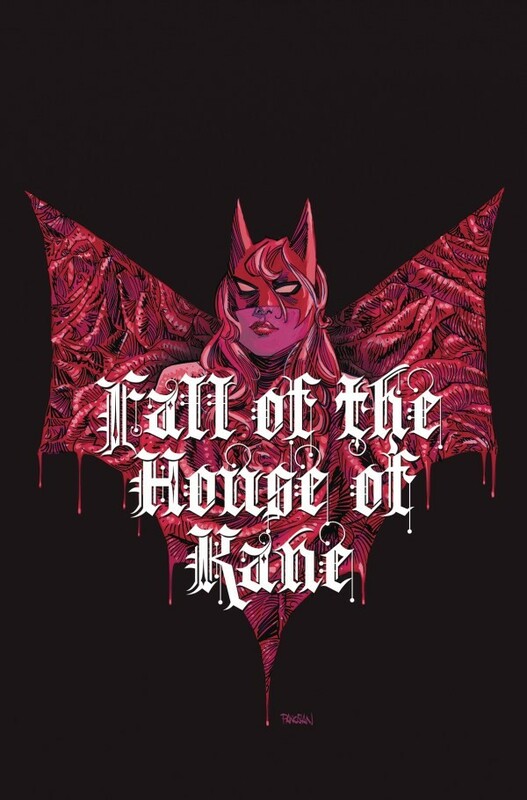 Batwoman #13 begins “The Fall of the House of Kane,” and propels Kate closer to the leader of the Many Arms of Death. Returning to her family’s old home in Belgium, Kate reflects on her mission thus far and what accomplishing it will mean going forward. Does the issue kick the new arc off in a satisfying way? For the most part, yes! Marguerite Bennett is plunging as deep into Kate Kane’s psyche as she can in this introspective and reflective issue. Most of the issue’s script consists of Kate walking through her family’s old home and her stroll is filled with creepy imagery and shapes appearing and disappearing the moment she turns to face them. Kate’s past is physically and mentally haunting her and though the issue doesn’t have a lot of action, the character work Bennett does through Kate’s trip through the haunted house makes for a spooky, compelling read. Just as in the previous issue, major revelations are made, and characters’ motivations continue to be made clear, making all the pieces of the series feel like they’re falling fully into place. Fernando Blanco continues to deliver excellently rendered line art in this issue, bringing to life (or rather, undeath?) all the creepy visions of foxes and Scarecrow syringes Kate sees around her old home. There are a few pages in this issue that follow a certain pattern I won’t spoil here, but Fernando’s clean lines and carefully selected details convey the full effect the patterns attempt. The nine-panel grids at use in these pages maintain a clockwork-like pace reminiscent of horror games like P.T. where something appears mundane, then suddenly unnerving. Blanco’s art and Bennett’s script work in tandem throughout to deliver an affecting, personal issue. If you’ve been reading the series thus far, you know the color red is the star of Batwoman and John Rauch and Fernando Blanco utilize it expertly in this issue. Roses, blood, Batwoman’s hair and cape, or a faint filter that covers a panel all pop and direct the eye to key motifs used throughout the series. The walls of the Kane’s decaying home are colored in sickly greens and blues, sometimes rendered a little brighter by the light of a bright orange candle’s flame. The coloring matches the tone well and though I wish the colors were a little darker to amp up the eeriness of the house, my qualm has more to do with taste rather than execution. Though this isn’t something I mind, some readers may be turned off by how heavy with exposition and reflection the issue is. The later portion of the issue does involve a lot of explanation rather than action, so if that isn’t your cup of tea, you may want to go into this issue prepared to read a lot, because the information conveyed is definitely vital to understanding the new arc, even if the characters had to get a little wordy to convey it. Batwoman #13 is a solid start to the arc that provides everything you need to know about the series thus far and delivers consistently executed, spooky visuals to boot. It feels like the series is hurtling towards some exciting confrontations and I can’t wait to see what Bennett and the team bring! An introspective, spooky script and equally unnerving visuals make this issue a solid start to the new arc and a great continuation of Kate Kane's mission against the Many Arms of Death. Marguerite Bennett's script delves deep into Kate's psyche and reveals a ton about where all the characters stand in the story so far. Fernando Blanco's art consistently delivers every visual the script calls for with clean lines and carefully chosen details. John Rauch's color matches the tone expertly and as usual, the use of red throughout the series by Rauch and Blanco continue to deliver an eye-catching motif. Some readers may find the issue to be a bit too wordy as there is a ton of exposition and explanation done in this issue.